We have 4 dogs and the backseat of our vehicle can be a mess! With sometimes when we take them somewhere their paws get dirty and muddy and all the hair! 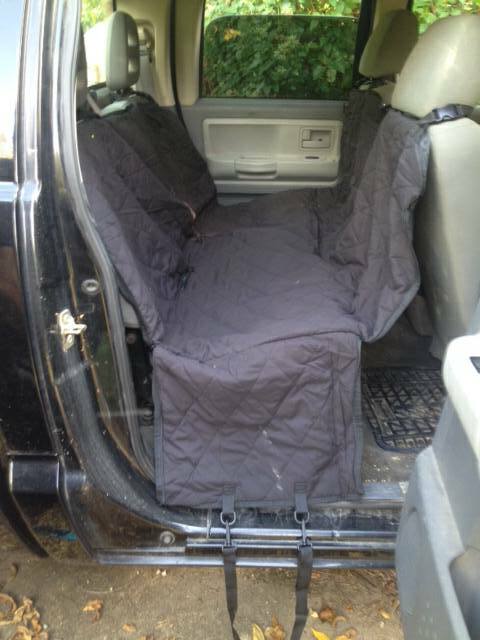 So we got INNX Water Quilted Microfiber Dog Seat Cover. It is 56″ W and 60″ L and fits perfectly! Heavy duty protection for our seats with reinforced stitching also adjustable straps! Protects our seats from scratches, hair, stains. Love that its water proof, our little dog gets nervous and has accidents. Easy to install and clean, covers doors and windows. They’ve pretty rough with it and its holding up really well! Non slip, safe for doggies and great for all size dogs!